Maybe your driveway is 125-feet long. Perhaps it's 1,000-feet long. Some driveways just never seem to end. If you have a very long driveway, and you're wondering what kind of snow blower to choose, we've got you covered. Having a long driveway to clear can be quite a chore. The quicker, easier, and more efficiently you can finish the job, the better. Consider your own driveway's characteristics, your physical limitations, and your comfort when choosing the right snow blower. Choosing a snow blower with greater clearing width will reduce the number of trips up-and-down your driveway. By choosing a 45" clearing width over a 22" clearing width, you'll cut your workload in half. With an 8-foot-wide driveway, you'll only have to make two passes with a 45" clearing width. That's down once, up once, and back into the garage for a hot cup of cocoa. Does your driveway wind around? Is it exceptionally wide? If clearing your driveway requires you to make several turns, this is a great feature to have. When using a large, heavy snow blower, you won't be looking forward to making manual turns. Frequently horsing a 224-pound machine around will get tiring fast. 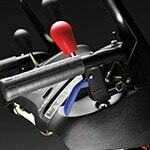 Power steering makes turning as simple as squeezing and releasing levers on the handlebar, so you won't tire out after the first pass. This is a feature you'll likely want if you're clearing a very long driveway. Don't strong-arm a heavy snow blower down a 400-foot driveway. 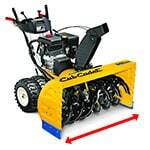 Get a self-propelled model to take the grunt work out of clearing snow. 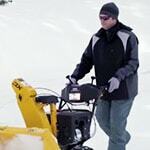 Self-propelled snow blowers feature a drive system to help you move the machine around with a lot less effort. This feature alone will make that snow-removal marathon a whole lot less treacherous. If your driveway features a steep incline, or if it frequently ices over, traction may be a major concern for you. Choosing a snow blower with a track drive system will provide superior traction for hills, ice, gravel, and deep snow piles. Track drive is like what you see on a tank. 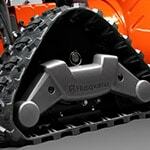 It uses flexible tracks that provide more surface contact so you can forge on without slipping. Snow Blowers for Long Driveways.. Our Power Equipment Direct how-to library can help you learn about Top-Rated & Best-Selling Three-Stage Snowblowers, Farmers Almanac Winter Weather Predictions and Proposition 65 Product Labeling.